Here's a brief shout out to some peeps that are doing the 2011 ESI Ironman 70.3 Augusta triathlon on Sunday, September 25th. As you probably already know the Augusta 70.3 includes a 1.2 mile swim, 56 mile bike, and 13.1 mile run. Ironman branded 70.3 triathlons are often referred to as a half-ironman or HIM. Participating in this year's race are Georgia triathletes Chad and Tamara Daniel of Peachtree City, Ken Cook of Griffin, Carlos Talbott of McDonough, and Sean Gray, along with about 3,200 others. Chad, Ken and Sean are all doing Ironman Florida as well this year. Chip, Richard and I met Sean on the Silver Comet Trail a few weeks ago. Sean, a Canton, Georgia paramedic, will wear bib # 343 to honor the number of firefighters who lost their lives in the September 11th, 2001 terrorist attack on the World Trade Center in New York City. Carlos is one of my Southern Crescent Cycling buds so he should do very well on the bike. I'm sure he'll perform respectably during the swim and run segments as well. The athlete's day will begin with a wave start swim segment. 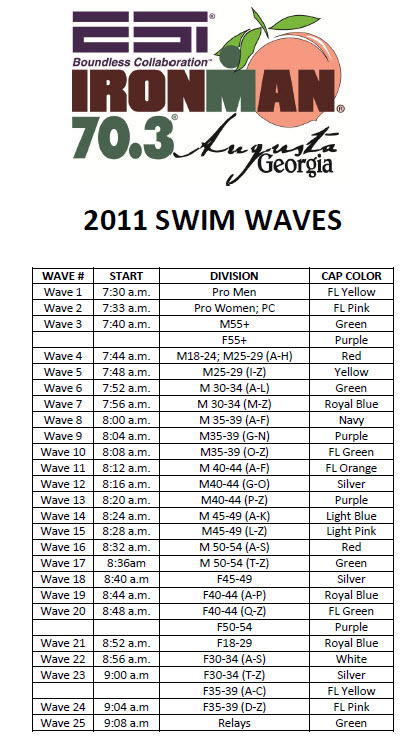 The Pros start at 7:30am and the final wave starts at 9:08am. Use the Ironman.com athlete tracker on Sunday to follow the athletes through the course as they cross over each timing mat. Fourteen Down - Six Weeks to Go! Thirteen Down - Seven Weeks to Go! Twelve Down - Eight Weeks to Go! Eleven Down - Nine Weeks to Go!